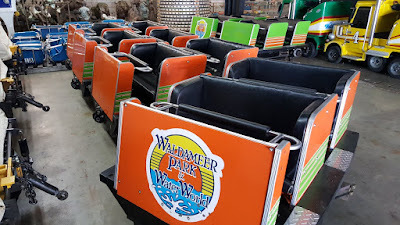 Once Waldameer's season ends, many of the rides perform somewhat of a disappearing act. 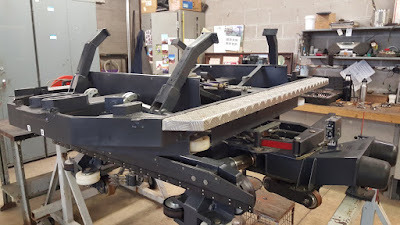 Some of them like Tilt-A-Whirl barely resemble their Summer look once all of the cars, lights, and canvas are all disassembled and stored inside for protection in the Winter. While many of our roller coasters have spacious stations and storage tracks to keep them protected while not in operation, their trains also seem to disappear. 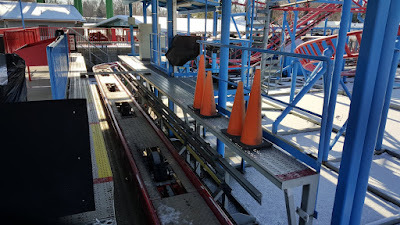 One might think with two trains of 6 cars on Ravine Flyer II, two trains of 4 cars on Comet, one train of 6 cars on Ravine Flyer 3, and 8 cars on Steel Dragon that there must be a big place to store all 34 coaster cars. When not humming with games, the Arcade serves as the Winter hiding place for many of our rides including our four roller coasters. Comet's orange and green trains with Ravine Flyer II's red train on the left. But the Arcade is only one stop on the Winter tour for our coasters. Over in the Maintenance Shop, we have cars from all four coasters deep into their annual off-season rehabilitation program. Let's take a glimpse into what it takes for each roller coaster to be ready for 2016. Once into the shop every car of every coaster train gets taken down to every last nut and bolt. Ravine Flyer II's blue train down to the last bolt. Once disassembled, it's time for a bath. The choices for this bath are a high-power pressure washer or a shower in kerosene. It's not uncommon to see a Maintenance Team Member outside in single digit temperatures pressure washing some of the larger coaster parts. After going though the parts washer, these Ravine Flyer II wheels look like new. 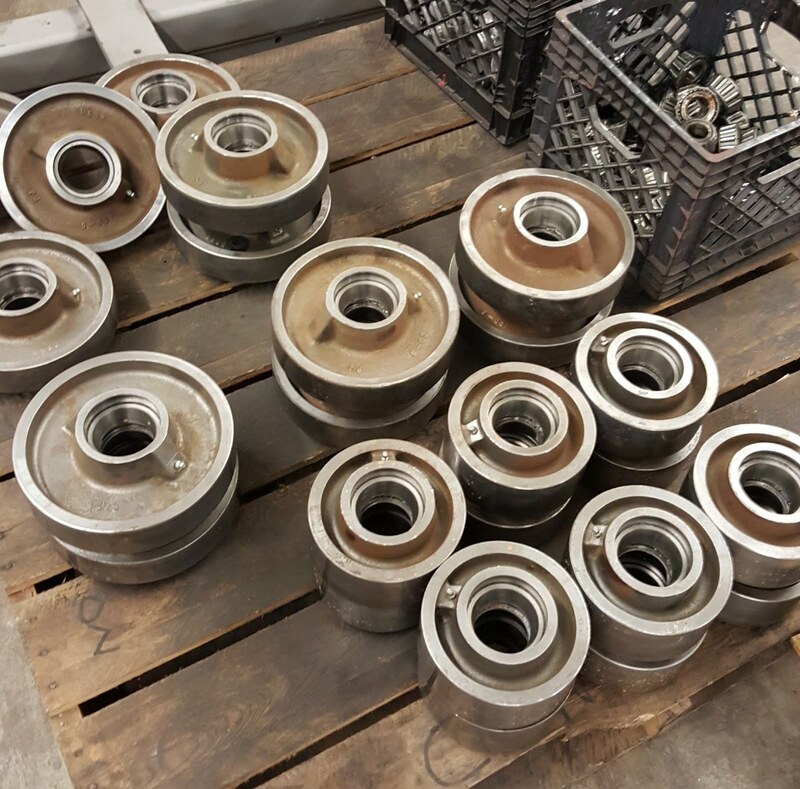 Once clean, many of the parts require sandblasting to remove paint in preparation for NDT. NDT stands for Non-Destructive Testing. This process is used to inspect and verify the integrity of parts under high stress or those that have welded components. 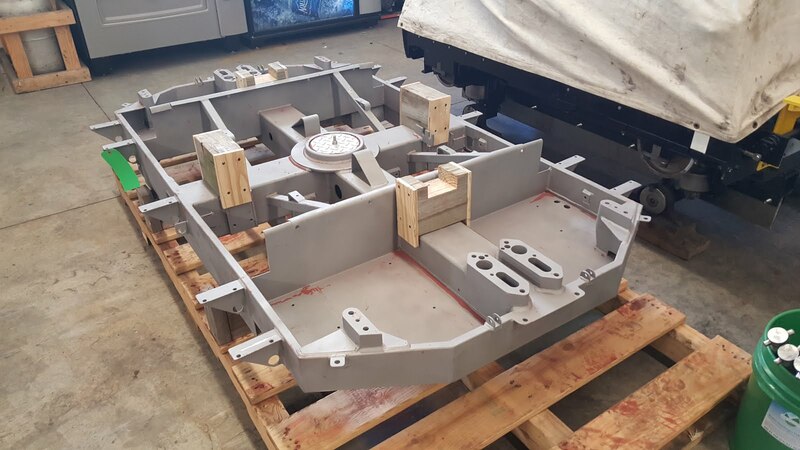 A Steel Dragon car chassis fresh out of the sandblaster and completed NDT. 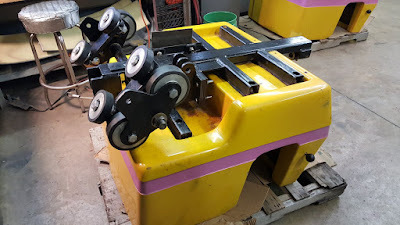 After all the parts are cleaned and inspected, the coaster cars are rebuilt, touched up on paint, and almost ready for another season. 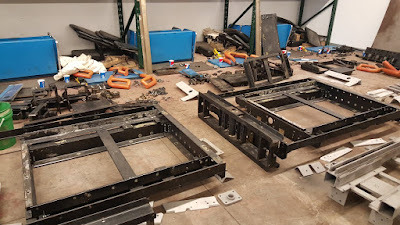 Might not look like it, but here is a Comet car in the early stages of reassembly. This Steel Dragon car is taking shape quickly. 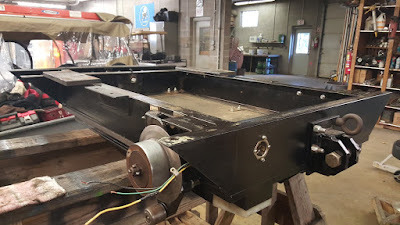 Finishing touches are being made on a Ravine Flyer 3 car. Every so often, coaster trains receive a special gift. 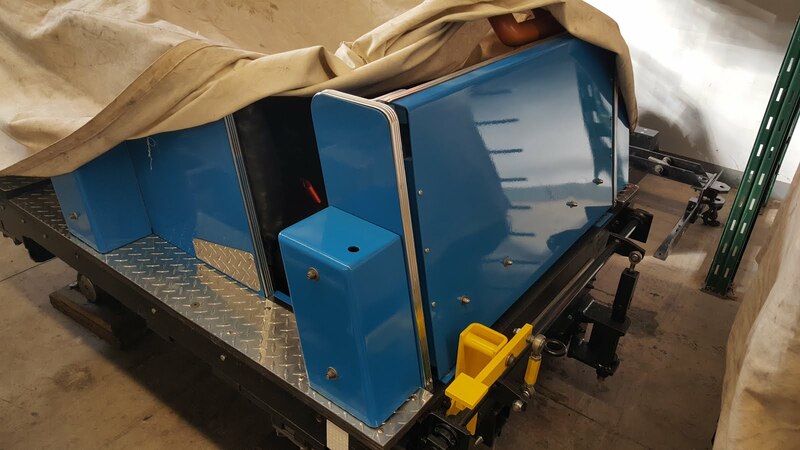 With eight seasons and now well over 1.5 million riders, we thought it's time to freshen Ravine Flyer II's trains up with a shiny new coat of paint. While the Maintenance Shop might be full of roller coaster cars for now, these are just a few of the many projects going on in the Shop this Winter. For example, L. Ruth Express and Tilt-A-Whirl are both receiving mechanical and cosmetic updates as well. For most of us it might be the "slow season" for Waldameer, but don't tell that to our dedicated Maintenance Team.